Nevada, MO. Publisher: Weltmer Institute. Editor: Sidney A. Weltmer; S.W. Weltmer, managing editor. 16 pp. This seems to have been an irregularly issued advertising vehicle for Sidney A. Weltmer’s psychic healing work and school (lessons by attendance at the school, by correspondence, and by mail order) in Nevada, Missouri. The advertising copy promoted the money-making potential of the Weltmer Course ("Last week I gave 134 treatments at $2.50 per treatment — receipts $335.00 for the week"), conveying the same message as Weltmer’s informative book How to Make Magnetic Healing Payi> (1901). 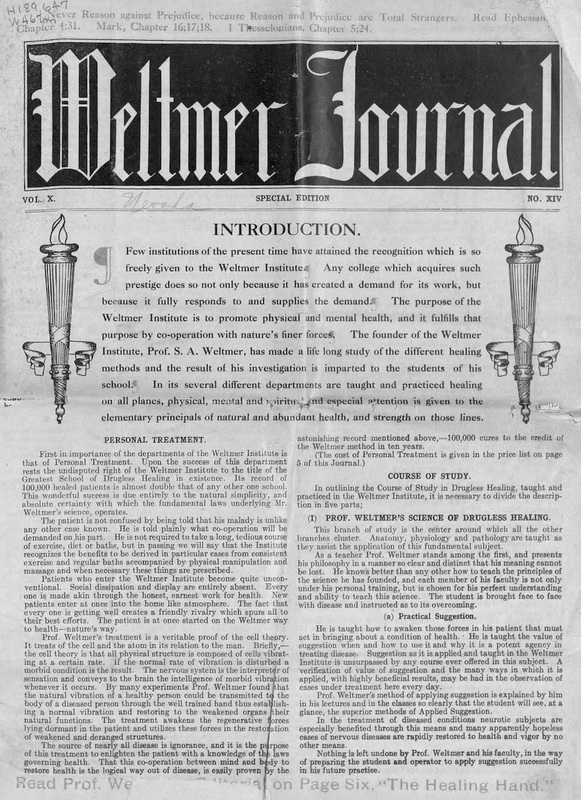 When his regular monthly journal, Weltmer’s Magazine, ceased publishing with the issue of July 1904, this seems to have taken its place, merging in 1906 with Grace M. Brown’s Fulfillment to form the revived Weltmer’s Magazine. On Weltmer, see the note under Weltmer’s Magazine. One issue in the State Historical Society of Missouri.